My Vacation Lady loves great packing tips— how to pack less, how to pack better and what you really should pack but never remember. 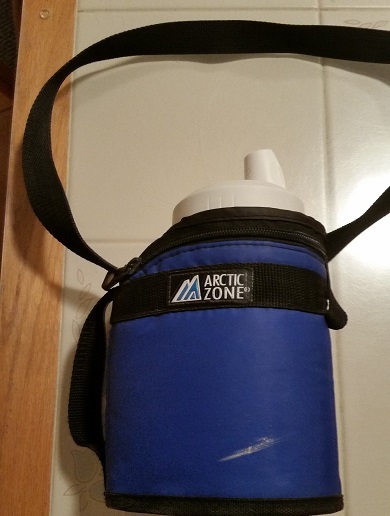 Reusable water bottle- we’ve been using these for years. Actually, I’m not even sure how old these are. We had 4 of them but are down to our last one. Some sprung leaks or we might have left them behind but I’m not getting rid of this one. We bought it in one of the Mart stores and have taken them on more vacations than I can remember. I fill it with 90% ice and 10% water and the water stays cold all day. The strap makes it easy to carry and it holds a lot of water. Laundry Bag- we typically take some zip lock bags in various sizes or plastic grocery bags to stash wet clothes or ones that got really dirty so they don’t get the rest of our clothes dirty. You don’t need to get fancy with this but the heavier gauge plastic the better. We’ve gotten some great laundry bags from the closet of our hotel rooms. They’re really used for the dry cleaning services at the hotel but they are great for storing our dirty clothes. First Aid Kit- even if you take Bandaids and some antibiotic ointment and toss them in the corner of your suitcase, you’ll be saving a fortune when you get a blister from walking around in new shoes. Hand Sanitizer – on our most recent vacation to Cuba, soap in a bathroom was a rare commodity. Boy, was I happy that I packed my larger travel size (3 oz) of Purell instead of the tiny one I usually have in my purse. Copies of travel documents- we’ve been recommending this for years. We have copies of our passports in a separate place in our carry on. We scan copies of all of our travel documents and put them in a folder that we can access from anywhere that we have internet access. This is a definite MUST do. Emergency Snack- a few years ago, I was on a flight home from Costa Rica. The flight was filled with families. We ended up having to make an emergency landing in Charlotte since there was a storm in the New York area and the pilot was running low on fuel. By the time, we took off again, our 4 1/2 hour nonstop flight turned into a 9 hour flight. There were no more snacks left on the plane and kids were crying because they were hungry. Since I try to eat gluten free, I always protein bars or trail mix with me– just in case, the only snack on the plane is a bag of pretzels. What is your packing tip? Send it to us and we’ll post it in one of our Tuesday Travel Tips on Facebook or in another blog post. My Vacation Lady specializes in personalized and customized vacation and honeymoon itineraries. Our goal is to make the planning process as easy and stress free as your vacation will be.